Rte 209 through eastern NY into PA is a nice drive….2-lane highway through rural farmland in NY, then in PA it enters the 40-mile river valley known as the Delaware Water Gap National Recreation Area. About halfway through is Dingmans Campground, where your Parks Pass will get you 50% off camping. They now have one loop with water and electric hookups, which I took advantage of. Thistle and I took a walk down to the Delaware River where I'd hoped to put the kayak in. We watched these two wading out with their Sea Eagle inflatable, trying to find water deep enough to launch. It didn't look too promising. When we left they were still only ankle deep and almost to the other side. So I decided not to even try. There's a long bike/hiking trail that passes the campground. The man in the office/store told me about another launch place for the kayak, but it stormed overnight and still looked too iffy in the morning. So Thistle and I took a ride to check out some hiking trails. Several lead to waterfalls….but uh-oh, didn't know Thistle couldn't come on them. So we found a place where he could have a nice walk, then I took him back to the RV. And I went back to hike to the waterfalls. This trail leads to 3 falls along Dingmans Creek. The first part is wheelchair accessible. And has accessible picnic areas along the way. The accessible part goes as far as the first waterfall overlook. 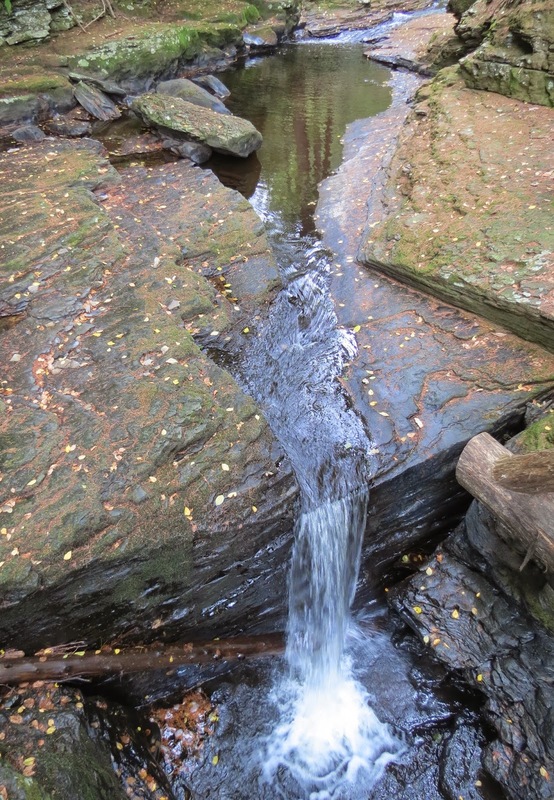 Dingmans Creek boasted a dozen mills at its peak, powered by the moving water. There were saw mills, a grist mill, cider mill, a paper mill and a woolen mill. Unfortunately there isn't much of a view from the platform from this side. From there, the trail is no longer wheelchair accessible. View below Factory Falls looking back upstream. I had the same problem at Fulmer Falls with foliage in the way of the view. So I had to go around and below the platform to see and photograph Fulmer Falls. Don't worry, I didn't go near the edge. The boardwalk crosses the creek and you can get another view of Fulmer Falls from the other side. And by following the trail up the other side I got a better look at the cascading Factory Falls. Joseph W. Childs bought this property in 1892 for the purpose of creating a public park where people from the cities could come and enjoy nature. The remains of the 1820s Woolen Mill were left standing near the top of Factory Falls and incorporated into the park. Only remnants of the walls remain today. This is a photo of the original entrance to the park. And the abandoned Woolen Factory as it appeared when the park first opened. Part of the old entrance is still standing. At the base of Factory Falls. Childs' widow donated the property to the Commonwealth of Massachusetts in 1934, and the CCC replaced bridges, built pavilions, and a ranger cabin for what became Childs State Park. In 1983 the state ceded the land to the National Park Service and Childs Park became part of Deleware Water Gap National Recreation Area. Work is still being done on the trails. A natural bench, hewn from a downed tree. The last waterfall is called Deer Leap Falls. This is the first glimpse from higfh on the trail. Some pretty flora growing on the wet cliffs. One of the bridges built by the CCC. 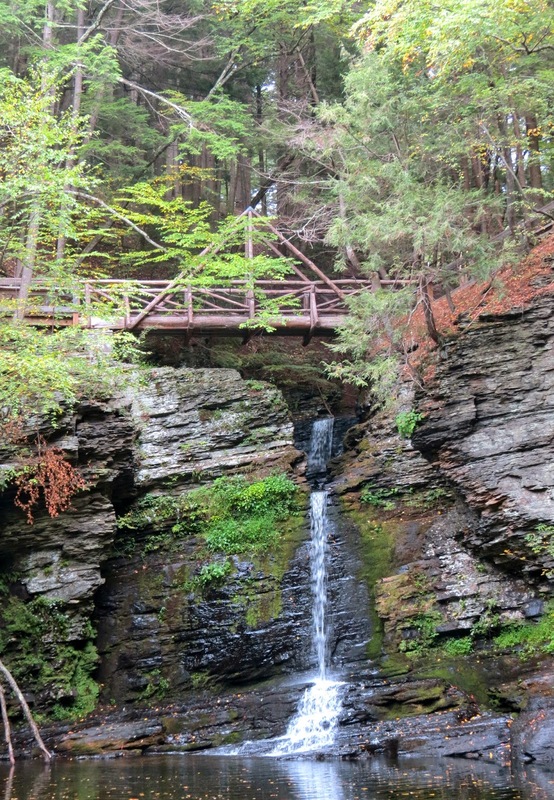 View from the bridge above Deer Leap Falls…the first leap. More of the stairways that crisscross the creek in the park. This small structure looks like it was an oven, probably built by the CCC. Meanwhile, back in the campground, this unwelcome visitor strolled by our campsite. Not to worry…Thistle's loud incessant barking sent him on his way…so he ambled over by the dumpster and back into the woods. In the morning there were wild turkeys in the campground, but I didn't have my camera. We've ambled on too and are now in southern Pennsylvania, free camping at Cabela's for a night. I walked all around the store, but just couldn't find anything I needed to buy. Tiny & I have traveled that route. I could have found lots to buy in Cabelas.